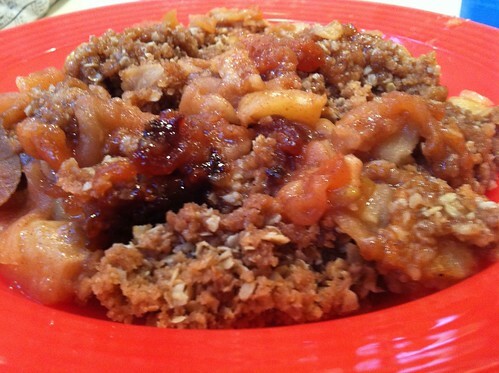 Crockpot Apple Crisp | Blog, Jane! Blog! I bought some apples this weekend. And first I was thinking applesauce in the crockpot, but then I realized I didn’t allow for enough time, so then I went to apple crisp in the crockpot. Only after I had it all ready, did I realize it’s not hard to make apple crisp in the oven. But this was good and it made the house smell wonderful for 2+ hours while it was cooking. The flavors were great too. I loved the subtle ginger & lemon flavors. I did make one modification to the recipe I started with. After mixing up the topping, I realized it didn’t look crunchy (because I had omitted the nuts) so I mixed in a cup of oatmeal. And after I had it cooking away, I read the reviews and found many others had done this too! One review mentioned this would be great for a potluck at work, the whole office could smell it cooking and it could be served warm! this is the leftovers, because I was so excited to eat, I forgot to photograph before putting this away. I LOVE apple crisp, and I’ll have to try this recipe. I’ve never made it in a crockpot before. I smiled when I read your caption because I do the same thing all the time.